This one started out slow for me, really picked up at about 50%, then ended pretty well. I do think it's one that a lot of people are going to like, and I'm super happy about the kissing that happened at the end. I like the cover concept a lot with the mask, the way the font is falling, and the fire and ice competing for dominance. I do think the cover model looks a little old for a teenager. 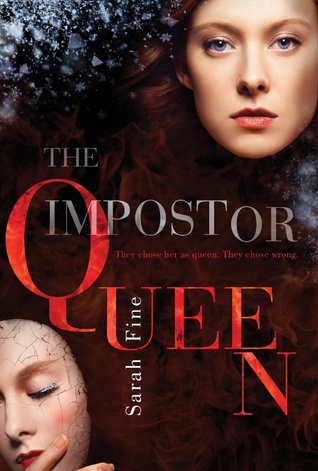 There was quite a bit of action in THE IMPOSTOR QUEEN. Torture, war, battles, daring escapes, magic and betrayal pepper the pages of this book. It's surprising that I was ever bored, but sadly the first half of the book almost had me setting it down. In the end, I'm glad I stuck it out. When Elli flees to the outlands, things get pretty exciting. The romance was pretty unique in this story. Elli has been isolated from practically everyone her entire life. The one person who loved her and showed her kindness was her handmaiden, and Elli finds herself drawn to her. But Elli is in a position of power over her, which makes acting on those feelings questionable. Later, in the outlands, Elli meets a boy, named Oskar, and over time develops feelings for him. The romance between them was full of that slow-burn tension and frustration that I love. I have to admit, I almost quit this book because of how much Elli annoyed me at the beginning. I can deal with naivete, but stupidity drives me absolutely insane. And, I'm sorry, but Elli was pretty stupid for the first half of the book. She ended up redeeming herself because of her pure determination, but she still has quite a ways to go in my opinion. I did love the way she insisted on learning everything she could, and holding her own. She never gave up, and in the end, she redeemed herself. I liked Oskar a lot. He's got integrity and a fierce will to protect those he loves. He's a little stubborn, but aren't they all? He's also got a mystery surrounding him, and that just makes him even more interesting. I loved the magic in this story. I like how the fire and ice contrast each other, and work to balance each other. I like the twisted twists, and the villainous villains. As I mentioned before, how completely stupid Elli seemed the first half of the book. She seriously drove me nuts. Yeah, this has a pretty decent cliffhanger. I mean, there is some resolution, but there's also a lot of unanswered questions for book 2. It's not one of my favorite books, but it was a good read. Those who like fantasy will probably enjoy it. Also, if you like Sarah Fine's other books, you'll probably like this one too. I probably won't buy it until I read the sequel. Right now I'm leaning toward reading it, but you know how it is after a year. Sometimes the books that aren't absolute favorites end up getting passed over when the time comes for book 2.